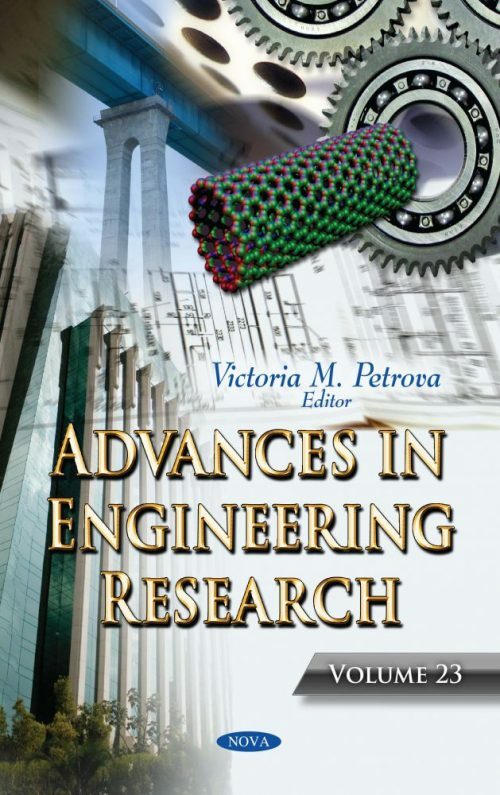 In the opening chapter of Advances in Engineering Research. Volume 23, the authors describe the unique challenges of the logging tool hardware, measurements, and the spin-dynamics modeling, as well as data processing. The second part of the chapter describes typical NMR pulse sequences that are used for logging measurements, NMR responses for fluids in rock pore systems, and the petrophysical interpretation models and methodologies for petroleum reservoir formation evaluation. Next, the laws of rolling are derived in terms of elastic and geometric properties of rolling bodies and foundations. The rolling resistance coefficient was analytically calculated in the cases of: a) an elastic cylinder rolling over another elastic cylinder of another material, in particular, over an elastic half-space, and an elastic wheel rolling over the rail of another elastic material; b) an elastic ball rolling over another elastic ball of another material, particularly over an elastic half-space; c) an elastic torus rolling over an elastic half-space of another material; and d) a cylinder, or a ball, or a torus rolling over a tightly stretched membrane or over a thin elastic plate. This collection also deals with pressure tests conducted in EOR (enhanced Oil Recovery) projects where heat has caused changes in the viscosity of the reservoir fluids, which creates a difference in mobility between two zones of the reservoir. Under those conditions, the reservoir becomes a composite with two different zones. As inaccurate results will be obtained if the interpretation of well tests is not conducted properly, the authors present a practical methodology for interpretation. Next, the different trajectory inhibitory effects of laser re-melting on coating microstructure defects are discussed. The results indicate that the laser re-melting trajectory exerts a significant influence on the microstructure of the re-melted coating defect prevention, in which the round orbit forms finer equiaxed grains, restrains the formation and propagation of crack source, and acts such that the hard phases, such as W2C, CrO, and Cr2O3, were strengthened by dispersion in the round orbit, and also improved the tribological performance of such re-melted coatings. The circular trajectory wear loss is 30.2 percent of that of the dot trajectory. Lastly, thermal spraying technology is analyzed as a key surface strengthening and protection method. After a hundred years of development of the process, thermal spraying technology has been widely used to prepare wear-resistant layers, corrosion-resistant layers, and various functional coatings. The authors analyze the microstructure, phase composition, element distribution, and micro-hardness of the interface between coating and substrate were analysed to provide a theoretical basis for the application and popularisation of laser remelting in the field of thermal spraying.